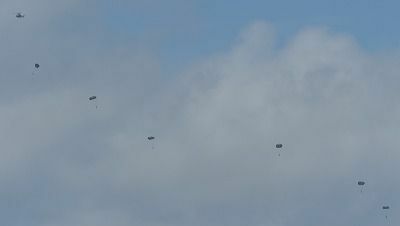 The U.S. military conducted parachute training in the ocean in the Tsuken Island training area the afternoon of July 19. The parachute training marks the fifth training conducted this year. During the three training sessions held that day, a total of sixteen soldiers dropped with parachutes. The training continued until 3:30 p.m. 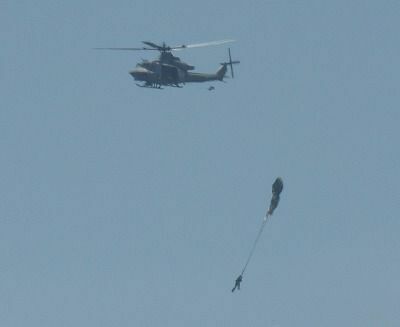 The first training was confirmed around 12:30 p.m. on July 19, with five soldiers with parachutes falling from a US helicopter to the ocean. At 1:09 p.m., six more soldiers dropped, and five more soldiers dropped from the helicopter at 2:14 p.m.
Six U.S. soldiers falling with parachutes during the second training done on the same day, at 1:09 p.m. The prefectural government, city government and the city council previously requested U.S. military to cancel the training in the area due to its high risk. The training is continued until 5:00 p.m.